Stockman Paper Merchants recently invested in a ASC M1 sweeper for their Bassendean (Perth) facility. Stockman is an independent wholesale fine paper merchant in Western Australia. Glen (Warehouse Manager) had an existing sweeping machine that was unreliable. He loved the idea of the ASC M1 sweeper was capable of dust free sweeping. Stockman run a large paper based warehouse and dust settling on the paper is a big problem for them. Since investing in the ASC M1 the amount of airborne dust has decreased substantially & the warehouse staff were pretty excited to have a brand new machine to use. 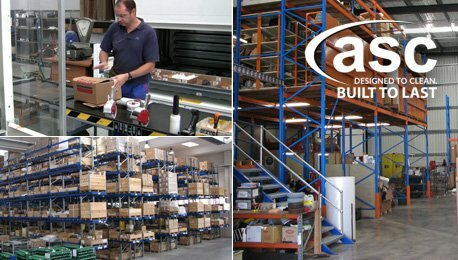 After Ross Sheehan (ASC WA Manger) arranged a 15 minute training session the staff were straight into sweeping the whole warehouse floor.